I am happy and joyous therefore I AM happy and joyous! Ernest Holmes once stated that Universal Subjectivity not only exists in the Mind of God/the Mind of the Universe, but actually IS the Mind of God. Therefore, any and everything that we create/put in the Mind of God/Creative Consciousness becomes real, materializes, manifests, becomes proof of the workings of the Mind of the Universe! Creative Consciousness is Universal Subjectivity, for it is Creation Itself; it can't judge; it merely multiplies with abundance and prosperity. It is ripe and fertile. If you are creating with your imagination art, music, thoughts, ideas, etc. of the Highest Order, then you are living The Law of Universal Subjectivity. 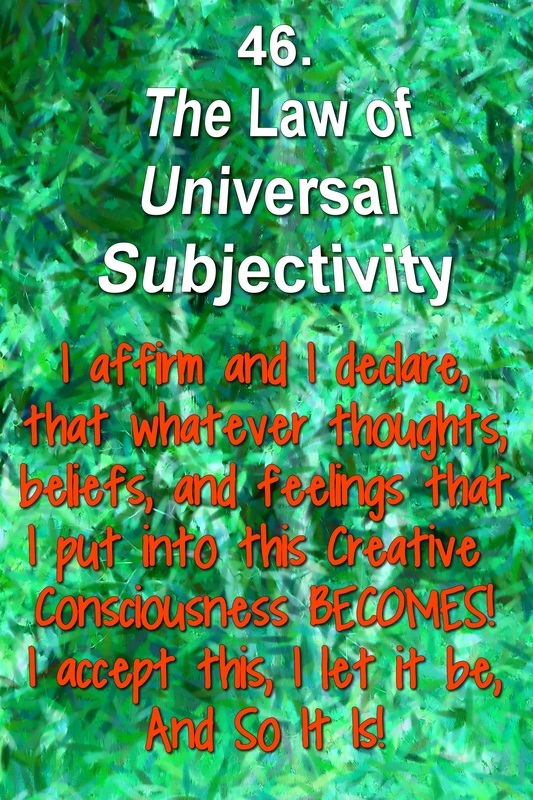 Meditative Treatment: I affirm and I declare, that whatever thoughts, beliefs, and feelings that I put into this Creative Consciousness BECOMES! I accept this, I release it, letting it be so, And So It Is!